The weather is cooler, the sky is cloudy, and we are waiting to see what hurricane Matthew is going to do to us. I hope it brings a good bit of rain and leaves all that wind out in the Atlantic. I took advantage of the changing conditions to get a few early fall chores started and to take stock of what is happening in the garden this day. The signs of change are everywhere. 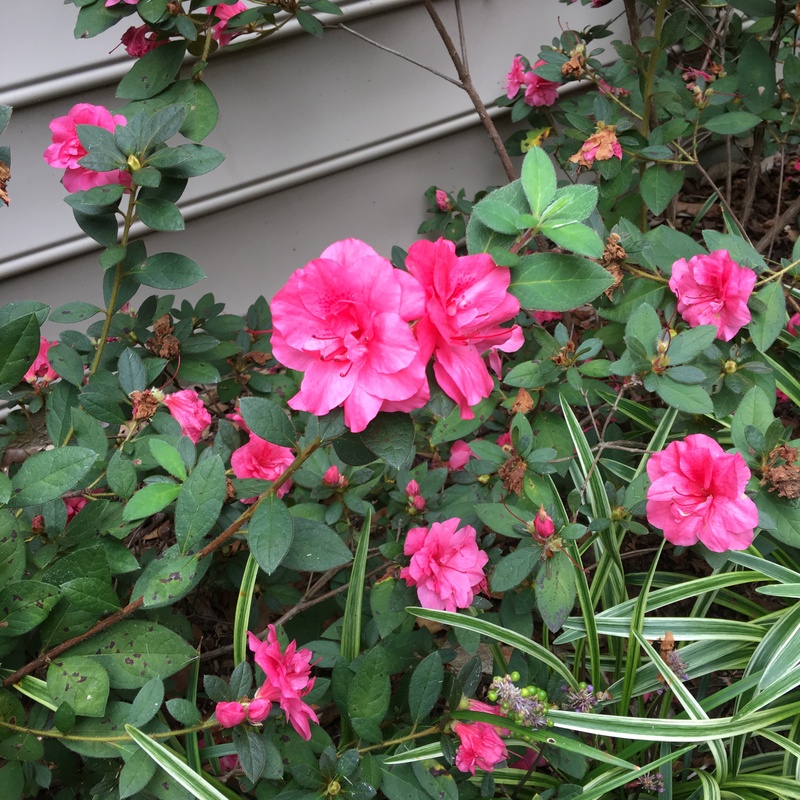 All of our Encore azaleas are beginning to bloom again; they add wonderful color in the garden now when so many other plants are slowing down. One bad note: some critter has been ripping up the lawn in the back garden. I suspect it is either a raccoon or a possum, and I further suspect it is digging for grubs. Whatever the culprit, it is really doing some damage. The lawn, pictured at left, was a beautiful carpet of thick greenery just a week ago. It’s starting to go after my neighbor’s lawn now, so maybe it has eaten all the goodies in my garden. Let’s hope. I’ve reseeded but will have to do something about those Japanese beetle grubs. Things are indeed changing; I just planted a pot with the season’s first violas. Thanks for joining me for this Walk in the Garden. This entry was posted in End of the Month View, Gardening. Bookmark the permalink. One huge difference I notice between you and here in France is we just don’t have many flowers left at all, it has been so so dry all summer and a few hours of rain a couple of weeks ago is all we have had, now it is dry again. The grass has turned a little greener, but the flowers gave up hope long ago. The vegetable garden is thriving thanks to my constant watering all summer, the tomatoes are still ripening and the aubergines still flowering, but the hydrangeas gave up weeks and weeks ago! I am tempted to say, “Vive le difference” but I don’t know if that would be received well or poorly. Either way, my tongue is in my cheek. We have certainly had years like yours; I have watered a lot like you this year to keep things going. Your hydrangea makes me nostalgic for mine in Port Angeles, WA. Mine had several hues in blue and burgundy. I dried them every year. They won’t get through the winters where I live now. 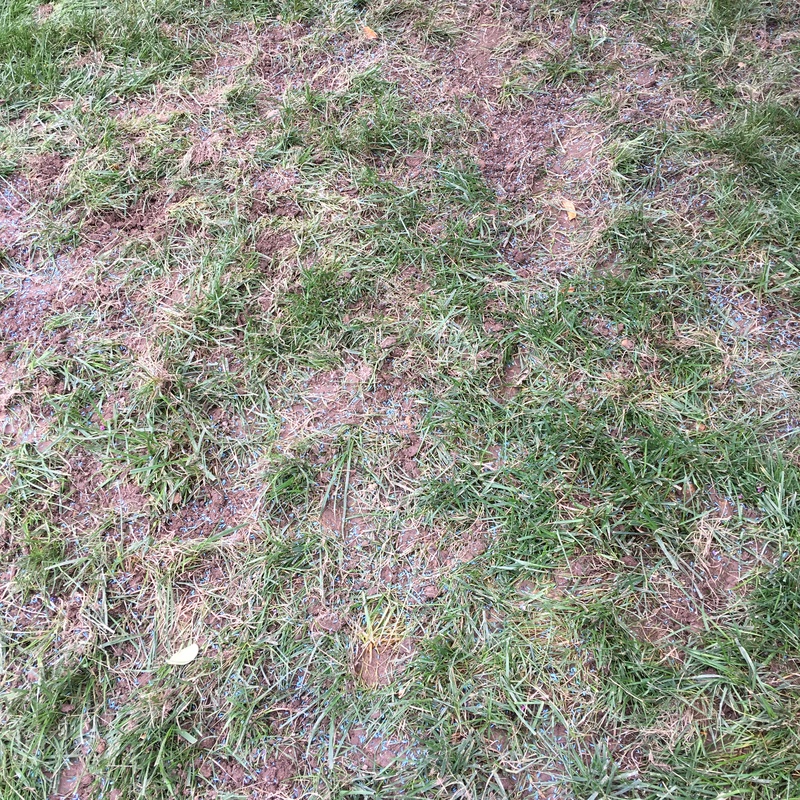 My grass often looks like this but it’s more from poor volcanic soil than critters, I think. I can add top soil every few years but it sieves down into the porous soil and disappears in little time. I love your garden photos. Thanks for your note, Kay. Sorry about your lawn. Luckily, seeding should bring it back to life in no time with a bit of rain…fingers crossed we get some sprinkles. Thanks, Marian. Any ideas about the grubs? It’s fun to read about your last blooms compared to our last blooms here in Alberta. We’ve had many heavy frosts, but my hardy tea roses just keep blooming! Glad to hear from you, Margie. Hope that rose keeps it up. Thanks for the autumnal visit to your garden John, You are very successful with re-flowering plants, I haven’t heard of repeat flowering Azaleas before reading about them here. I didn’t dead-head my Vitex after being so disappointing that the flowers were so small and insignificant and NOT blue! Thanks, Christina. I am sorry that your vitex hasn’t lived up to expectations. Keep an eye out for a blue one. I certainly will. It is the one plant I remember from my US trip last year.